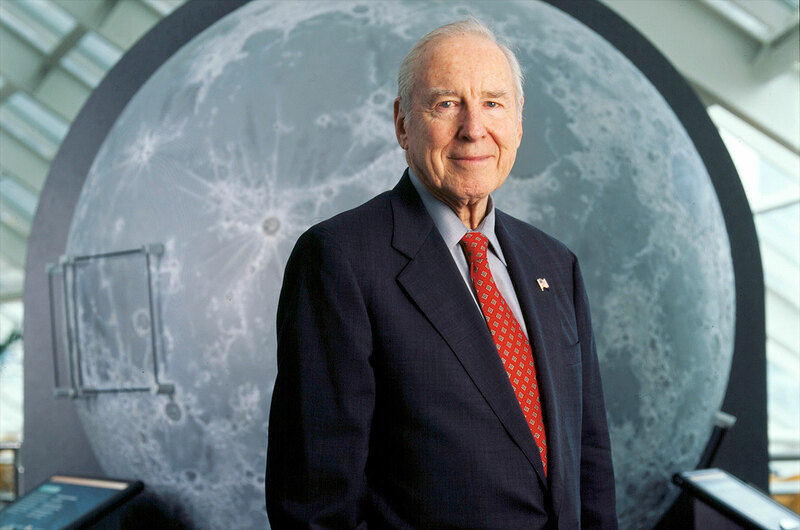 — Gemini and Apollo astronaut James A. Lovell has announced he will consolidate his personal collection of NASA memorabilia and contribute it to the Alder Planetarium & Astronomy Museum in Chicago, IL. His donation, as well arrangements for the National Air and Space Museum to loan one of his spacecraft to the museum for display, is timed to coincide with the 75th anniversary of the Adler, a celebration chaired by Lovell. "The Adler inspires young and old alike to learn about space science which contributes to our national identity as a science and technology leader," Lovell said while visiting the museum last week. "I can't imagine a better use of my collection than in this noble effort." Lovell's collection includes documents, memorabilia and personal space artifacts. It is presently widely displayed in a number of museums, in his home and at his and his son's restaurant, Lovells of Lake Forest, in Illinois. 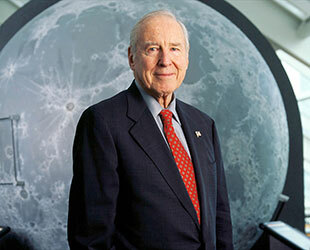 Lovell's announcement coincided with the anniversary of the Apollo 13 mission. On April 13, 1970, Lovell and his crew successfully modified the Apollo 13 lunar module into an effective lifeboat when its oxygen system failed. Their resourcefulness helped return them safely to Earth. Prior to Apollo 13, Lovell piloted the first rendezvous of two manned spacecraft in 1965, and the last of the Gemini flights that perfected spacewalking in 1966. He then served as navigator for the epic six-day journey of Apollo 8, man's maiden voyage to the Moon. Until he was surpassed by Skylab astronauts, Lovell held the record for most American hours in space: 29.8 days (715 hours and 5 minutes). Adler President Paul H. Knappenberger Jr. has named Lovell the honorary chairman of the museum's year-long 75th anniversary celebration, which begins on May 12. "[Lovell] recalls the thrilling early moments of human space exploration, a phenomenon never anticipated when Chicago's famous planetarium was founded by Max Adler in 1930," said Knappenberger. "He also encourages us to look forward and inspire the next generation of explorers." The museum's anniversary plans include a new focus on human space exploration. As part of that effort, the Adler has reached an agreement with the Smithsonian National Air and Space Museum to exhibit Gemini 12 on a long- term basis. The spacecraft, one of four Lovell flew during his time as an astronaut, is presently at NASA's Goddard Space Flight Center. At Lovell's request, it was approved for relocation from Maryland to the Adler. The Gemini 12 capsule will be the centerpiece of a new interactive exhibition about America's space program to be unveiled in 2006. As part of the loan agreement, the Adler will help the Smithsonian conserve the object, a process that will require many months. When the work is completed, the newly restored Gemini 12 spacecraft will be displayed in a specially-designed exhibition case to prevent additional erosion of its facade and components. "It is an honor for a Chicago institution to be asked to display and assist in preserving a national treasure like the Gemini 12 capsule," said President Knappenberger. To recognize Lovell's achievements, the Adler has also commissioned a life-like seven-foot sculpture. In late June 2005, Chicago Mayor Richard Daley will dedicate the sculpture in the Adler's restored Rainbow Lobby. The sculpture is intended to commemorate man's quest to explore beyond the Earth and will feature one of Lovell's most famous quotes: "I have seen the Earth as it truly is ...a grand oasis in the vastness of space."